It wasn’t the start both Stocksbridge Park Steels and Sheffield FC would have hoped for, as both slipped to defeats on the opening day of the season and had a player sent off. However, Frickley Athletic made it a winning start with a 1-0 victory at Division One East newcomers Wisbech Town. It was certainly an entertaining game at Bracken Moor although ten-man Stocksbridge came out on the wrong end of a 4-2 scoreline against Stamford. Steels got off to a flying start opening the scoring inside the first minute when Scott Ruthven sidefooted home from Tyler Williams pass after a good run into the box. The lead was short lived though as Stamford hit back to equalise just two minutes later, Stan Mugisha taking advantage of a misunderstanding in the home defence to score from close range. 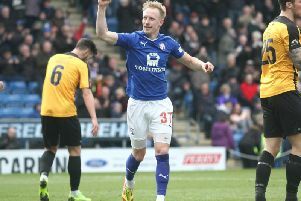 Williams had been tormenting the visitors defence with his pace so it came as a major blow when the winger was shown a straight red for a mis-timed tackle on Stamford captain Cleveland Taylor. Stocksbridge ought to have had a penalty three minutes before the interval when Ruthven was bundled to the ground having almost had his shirt ripped off his back by the Stamford centre-half. Ben Rhodes came to Steels' rescue on the stroke of half time clearing a header off the line. However, the visitors did grab the lead two minutes into the second period. Brad Fortman-Tomlinson with a superb volley across goal after a pass had deflected nicely into his path. Jordan Cooke headed the visitors further in front on 62 minutes from a corner with Mugisha grabbing his second four minutes later latching onto a through ball to round Jordan Greaves for 4-1. Steels threw on Aaron Moxam and youngster Lewis Whitham and the two combined on 83 minutes to pull it back to 4-2. Whitham’s placed shot was heading for the bottom corner until the 'keeper got a hand to the ball but Moxam reacted quickest to steer home the rebound for his first goal for the club. Stamford had the chance to restore the three-goal cushion when Greaves conceded an unnecessary penalty but the keeper made amends, getting down to push Fortman- Tomlinson’s effort away. “It was certainly an eventful start," said Steels boss Chris Hilton. “We’ve scored inside the first minute conceded a goal just two minutes later. Then we were forced to reshuffle due to injury then had an player sent-off all inside the first 30 minutes or so. Sheffield FC crashed 4-0 at Marske United and had skipper Andy Gascoigne sent-off early in the second half, on a day to forget for Club’s new boss Gavin Smith. The hosts went in front on 28 minutes through a Crag Gott free-kick. Sheffield responded with Jamie Gregory going on a fine run only for his final effort to finish up in the side netting. Then Mitchell Dunne got put through but was denied as he tried to go round the keeper. Marske though doubled the lead on 55 minutes when Jamie Owens nodded in from a free-kick and moments later Club were down to ten men with Gascoigne taking an early bath for remarks to the referee. Frickley though got off to a winning start beating another of the division newcomers Wisbech Town 1-0 away. The only goal of the game came in the 15th minute, Jacob Hazel exchanging passes with Gavin Allott before crossing for Tyler Walton to score with a deft back-heel. Wisbech had the chance to level just before the interval when they were awarded a soft penalty but Hugo Warhurst pulled off a fine save to keep the visitors' lead intact. Buxton lost out 1-0 at Whitby Town but Matlcok Town got off to a good start beating Lancaster City 4-0 at home. Shaun Harrad started the ball rolling with a 30th minute penalty before doubling the lead ten minutes into the second half. Former Hallam player Kieran Watson added a third on 79 minutes with Jamie Hackson completing the scoring five minutes from time. Premier Division: Nantwich Town v Buxton, Scarborough Athletic v Matlock Town. Division One East: Frickley Athletic v Marske United, Gresley FC v Stocksbridge PS, Sheffield FC v Tadcaster Albion.